Billionaire George Soros’ network of foundations contributes tens of millions of dollars annually to groups that wage "political warfare" against Israel, according to a new report. The report by NGO Monitor tracks the finances of the Open Society Foundations (OSF), which are headquartered in New York City and provide grants to numerous domestic and international programs—including several in the Middle East. OSF’s global network spent almost $910 million in 2012. Several of the OFS-sponsored groups support boycott, divestment, and sanctions campaigns against Israel, equate Israel’s settlements in the West Bank and the Gaza Strip with South Africa’s former apartheid regime, and in some cases deny Israel’s right to exist. One of those groups is Adalah, a human rights organization and litigator for 1.2 million Palestinian Arabs living in Israel that has previously received funding from an OSF branch. Adalah has decried what it views as "racist" laws affecting Palestinian citizens in Israel and compared the "colonial designs" of Israeli settlements to apartheid. Adalah received $475,950 in 2010 and $204,275 in 2011 from the New Israel Fund, a group with ties to OSF, according to the fund’s financial reports. Gisha, an Israeli nonprofit organization funded by OSF entities, aims to "protect the freedom of movement of Palestinians, especially Gaza residents," the group’s website states. The organization routinely contests Israeli security measures in court, such as the blockade of Gaza and other movement restrictions. Gisha collected $658,000 from OSF entities between 2007 and 2011, according to the report. "[The funding of groups by OSF entities] suggests a pattern of institutional hostility to Israel that really doesn’t advance the cause of peaceful coexistence and a negotiated settlement," Alexander Joffe, historian and author of the report, told the Washington Free Beacon. Soros has criticized Israel and donated large sums to groups that focus their work on criticizing the Jewish state. He awarded his largest ever grant of $100 million to the controversial group Human Rights Watch (HRW) in 2010, after HRW’s founder publicly censured the group over directing the "brunt" of its criticism toward Israel. HRW was also condemned by pro-Israel groups after some of its leaders endorsed the 2009 Goldstone Report. The report claimed that Israel intentionally targeted civilians while fighting in Gaza. Richard Goldstone, author of the report, withdrew that claim in 2011. The NGO Monitor report also faults Soros for not living up to his own stated ideals of transparency and accountability and calls on the OSF network to "institute complete transparency." While Soros claims to support an "open society" philosophy that promotes equal access to knowledge, political freedoms, and human rights, groups like HRW devote most of their reports and attention to Israel. The group has afforded relatively minor importance to countries dominated by dictatorships, such as Syria and Yemen. Other OSF-linked groups appear to intentionally operate as clandestine conduits for Soros’ money. For example, the Stiftung Open Society Institute—registered in the small tax haven of Zug, Switzerland—is a major financial supporter of OSF–London, one of the largest OSF branches, the report states. The Stiftung Open Society Institute does not publish an annual report and is subject to lax disclosure laws in Switzerland. A 2009 partnership agreement between the Stiftung Open Society Institute, also known as OSI-Zug, and Bulgarian associations at one point states that any additional uses "of OSI-Zug's name shall not be made without express written approval from OSI-Zug." OSF’s global network allocated about $285 million for "Governance and Accountability" issues in 2012, the most of any category. "This is very typical of what one finds with philanthropy," Joffe told the Free Beacon. "They talk a good line, but they really don’t behave that way." The Open Society Foundations did not return a request for comment by press time. Soros’ Foundation to Promote Open Society has previously donated to the National Iranian American Council, a group long suspected of lobbying for the Iranian regime. The foundation has also funded progressive activist groups, including donations of $825,000 to the Center for American Progress (CAP) and $675,000 to Media Matters in 2010. Both CAP and Media Matters have been denounced in the past for using anti-Semitic language in their tweets and writings. 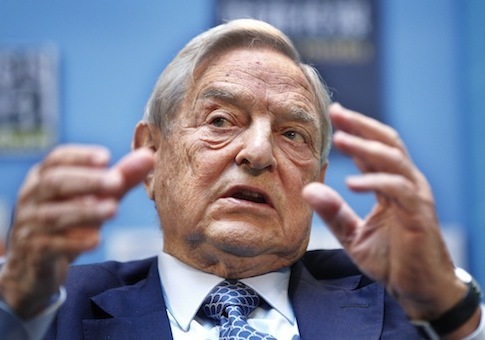 Joffe said that although Soros does not direct all of the spending by the various foundations, his public statements and positions deserve more scrutiny. "He has a philosophy which has to be taken seriously; his politics flow from his philosophy," he said. "His money catalyzes a lot of other peoples’ money." This entry was posted in National Security and tagged Democratic Donors, George Soros. Bookmark the permalink.